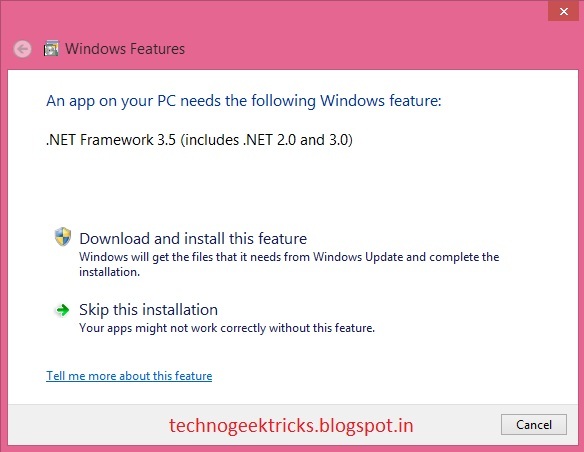 If you have installed Windows 8, you might have seen that when you try to install some softwares, a window pops up saying "An app on your PC needs the following feature: .NET Framework 3.5" as shown on the picture below. It is because this feature is not enabled by default. You can proceed to the software installation menu either by "Downloading and installing this feature" or by "Skipping this installing". If you go for download, it will download a huge file of about 200mb. Step 1: Insert the Windows 8 disc. Step 2: Run Command Prompt (cmd) as Administrator. Step 3: Now, just copy and paste the below code (the G on Red color is your Disc Drive letter, replace it with your disc drive letter) on command prompt and hit 'enter'. Step 4: When its successfully done, restart your PC and enjoy!